A long-running urban legend holds that terrorists have acquired a large number of UPS uniforms to be used in attacks against citizens. Let’s first take a look at the latest version of the warning, which appears in the form of an official-looking letter titled “Homeland Security Warning” dated November 18, 2015. There has been a huge purchase, $32,000 worth, of United Parcel Service (UPS) uniforms on eBay over the last 30 days. This could represent a serious threat as bogus drivers (terrorists) can drop off anything to anyone with deadly consequences! If you have ANY questions when a UPS driver appears at your door they should be able to furnish VALID ID. Additionally, if someone in a UPS uniform comes to make a drop off or pick up, make absolutely sure! they are driving a UPS truck. UPS doesn’t make deliveries or pickups in anything, except a company vehicle. If you have a problem, call your local law enforcement agency right away! TAKE THIS SERIOUSLY! Tell everyone in your office, your family, your friends, etc. Make people aware so that we can prepare and/or avoid terrorist attacks on our people! Thank you for your time in reviewing this and PLEASE send to EVERYONE on your list, even if they are friend or foe. We should all be aware! The warning above is completely without merit and clearly did not come from the DHS. The most recent version of this urban legend is only the latest in a long string of recurrences which date back over a decade. During one recurrence of this rumor, Truth or Fiction noted that UPS stated there were no missing uniforms, and that no such sale had been witnessed on eBay. Further, a staff member from the Department of Homeland Security confirmed that no such warning had been issued. It should also be noted that the grammar and language used in the warning above is not what one would expect from a government agency. The all-caps phrases and extensive use of exclamation points are simply not the manner in which alerts and press releases are constructed. Compare the warning above to an actual DHS press release regarding the terrorist attacks in Paris, dated November 13, 2015. As the President noted this evening, the attacks tonight in Paris are not just attacks on the people of France, but attacks on all of humanity and the universal values we share. The Department of Homeland Security and the Federal Bureau of Investigation are closely monitoring events in Paris and we are in contact with our counterparts in the region. At this time, we know of no specific or credible threats of an attack on the U.S. homeland of the type that occurred in Paris tonight. As we do regularly, and out of an abundance of caution, DHS and the FBI are consulting with state and local law enforcement. We are also in communication with relevant private sector organizations to advise them of what we know, and to hear from them about security precautions they may take. Americans should mourn the loss of all those killed in Paris tonight, and we stand together with the French people in the fight against terrorism and extremism. Scambusters points out that eBay banned the sale of UPS uniforms back in February 2003, and that UPS performs background checks on all of its employees. It would also stand to reason that if terrorists wanted fake uniforms, they could simply have some made without raising the suspicion that a $32,000 purchase would bring. The warning that terrorists have acquired a large number of UPS uniforms is a long-standing urban legend that has circulated for over a decade. 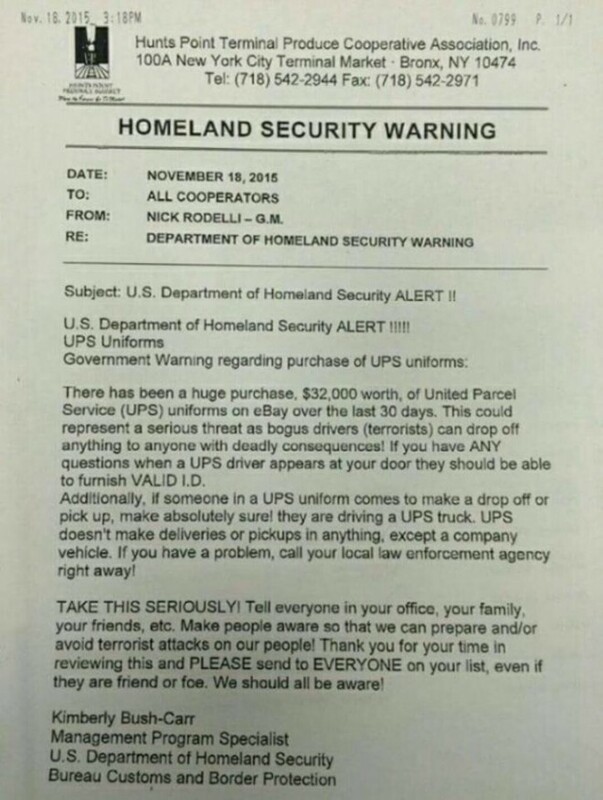 There has never been such a purchase, UPS uniforms are now allowed on eBay, and several agencies have confirmed the warning to be a hoax. If you’re uneasy about a driver showing up to your door, you can call 1-800-PICK UPS to verify a delivery.